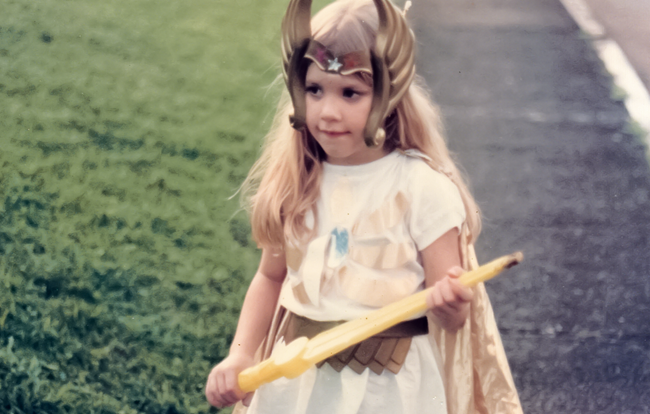 Somewhere in your home, there’s a box of old analog photographs you probably want digital copies of. Unless you know how to use your scanner correctly, the image quality can turn out poor. Here’s how to get the best results. If your memories are important to you, then it’s worth taking the time to do them right. 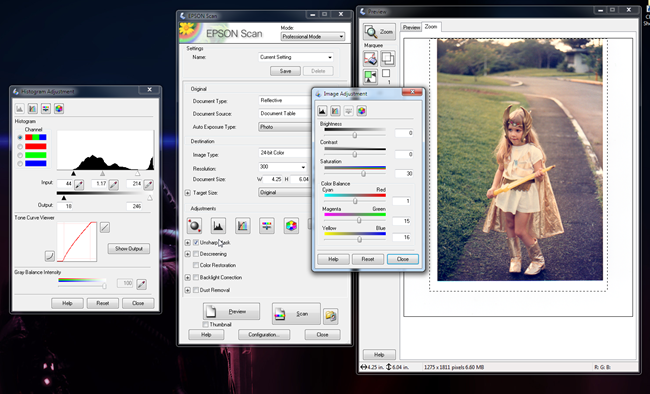 Today we’re going to look at the largely overlooked tools and methods that’ll give you the best possible quality out of a scan of a less than perfect photo. We’ll see how to make the most of the scanning software and how to use graphics programs to make the image look better than the original photograph. Keep reading! 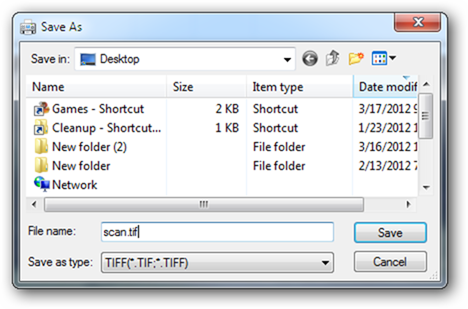 Because every scanner driver is different, we’ll be starting out today with “Windows Fax and Scan,” a program included with Windows 7 that will scan for you even if you don’t have any other program to capture images. 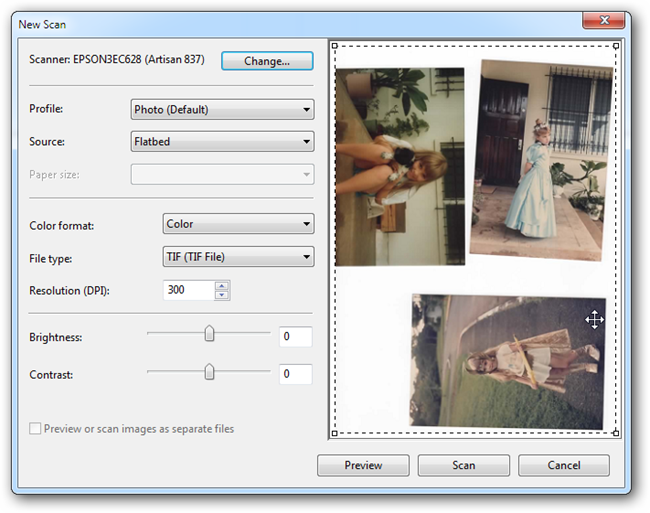 Once we’ve covered the basics here, we’ll take a look at the Epson Scan program that comes with most Epson scanners. This is a fairly common program and should give you an idea of the kind of fine tuning you can do with the software bundled with your scanner. Windows Fax and Scan is a basic, stripped down program that will perform the most basic functions of scanning if you can’t get your scanner driver to work or haven’t installed it. The program is a pretty basic one. We won’t insult your intelligence and tell you how to use the “Preview” and “Scan” buttons, as most things are fairly straightforward in this program. Your options are pretty threadbare. 300 DPI is a good pixel density to scan at for printing. And while the difference between “Color” and “Grayscale” is obvious, keep in mind that “Black and White” is actually a single color mode. All edges will be jaggy, and no anti-aliasing is allowed. This is a good mode for scanning line drawings, but horrid for photos. Use color or grayscale for best results. Modern scanners are very well engineered to replicate a good image straight out of the box. But there are several mistakes being made here. Let’s take a look. Straightening photographs smears the pixels and can result in a loss of resolution, so scan your photographs square to the edge of the flatbed lip. In addition to this, since we’re going to learn about making adjustments pre-scan, we’re going to only scan one image at a time. It’s more or less impossible to properly adjust three images at a time. They’ll have drastically different shadows, highlights, and midtones—even the automatic adjustments made by the scanner will likely be more accurate if images are scanned one at a time. 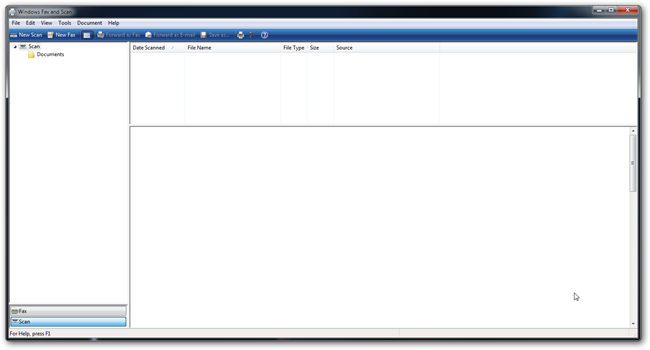 Save your file in a lossless format. JPG is not ideal as it is lossy. TIFF or PNG are the best formats as they compress the image file without creating artifacts or destroying the image quality. If you can help it, only use JPG to email files, never to archive them. Usually, these drivers start out in a “Home,” “Basic,” or “Office” mode for beginners. The professional mode gives you more options and isn’t that intimidating. There are a lot of various options, most of which will be okay set to default. If you have the option to scan in 24bit color, it’s your best bet. Most graphics files are 24-bit color, so we’ll start there. You also likely have greater options for pixel density, although a photo scan higher than 300 DPI is almost a waste of your time. The exception to this is if you’re doing enlargements. The basic preview and scan buttons work as normal here, so we will be skipping right to the more technical parts. 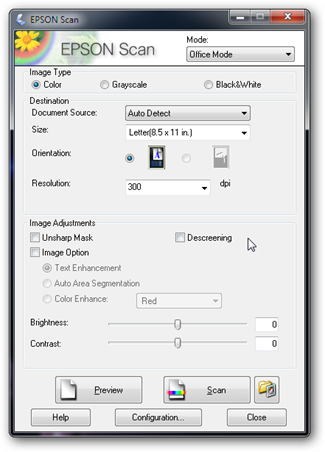 Here’s where it pays off—your scanner driver should have some buttons that adjust levels and saturation. Making these before the scan can greatly improve image quality. 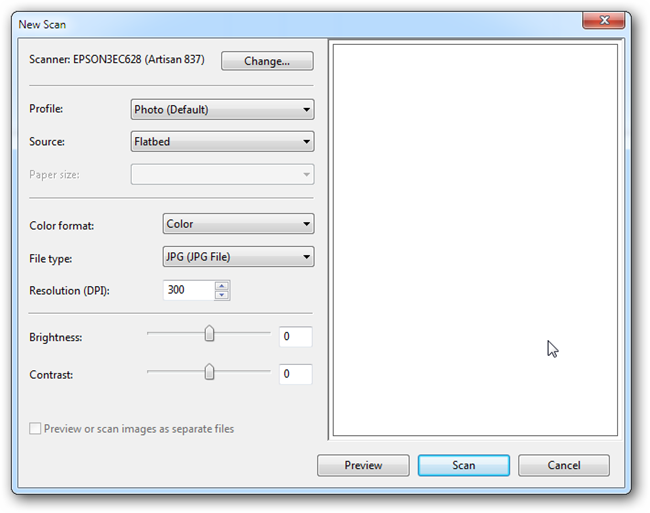 The basic idea is this: you can scan with default settings and make big adjustments in Photoshop or GIMP. But those edits are destructive to the image. They basically take the information already inside the image and stretch and squeeze it, throwing away detail. When you make adjustments to a histogram before you scan, you begin with a full value range without any tones that have been tossed out by a graphics program. This is why it’s not a good idea to scan multiple images at once—making precise adjustments with the scanner driver is impossible with multiple photos in the scanner bed. If you have no idea how to use tools like the levels tool in the scanner, you can brush up by reading about how to adjust contrast like a pro. Again, save your file in a lossless format. JPG is lossy. Lossy is bad. 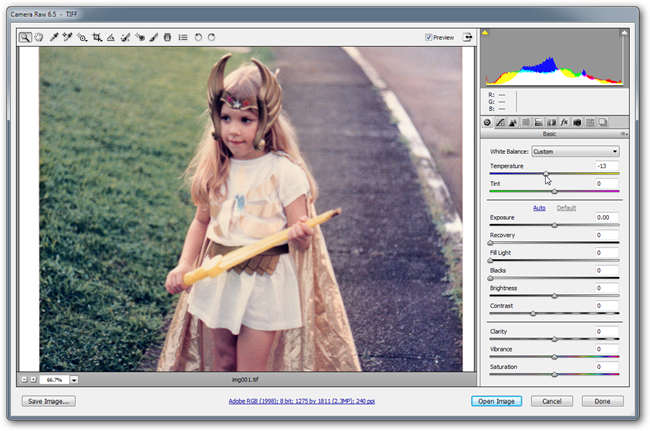 TIFF or PNG are the best formats without creating artifacts or harming the image quality. Remember, never use JPG to archive or print images, only to email them or upload them. Printing from JPG will result in an inferior print compared to an original lossless PNG or TIFF. 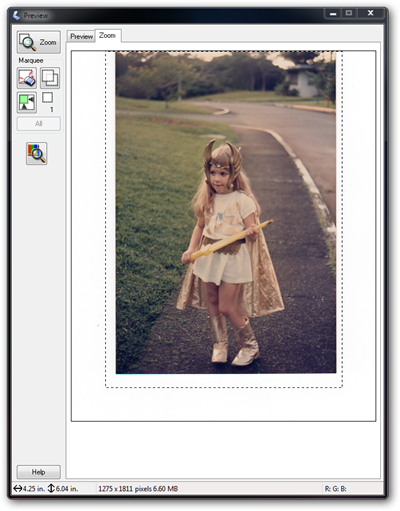 Photoshop, GIMP, or a comparable graphics program should be your last step in your scan. 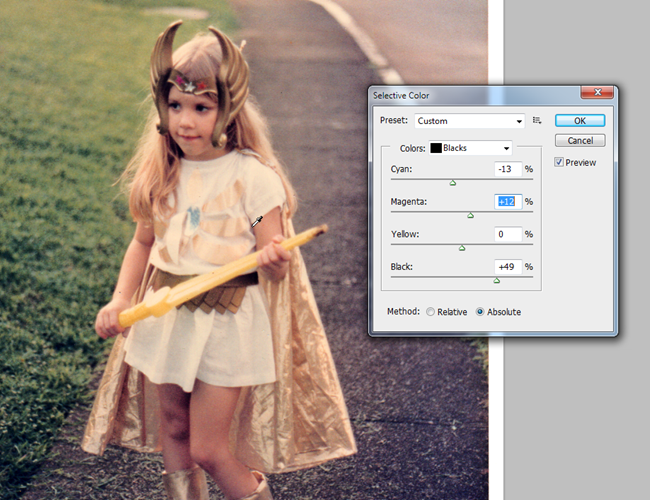 Here you can use tools like the “Selective Color” to make adjustments to repair problems with the original photograph that show up in the scan. You may want to “de-vintage” your images, using the Selective Color tool (in Photoshop: Image > Adjustments > Selective Color) and adjusting certain color and value ranges selectively. In this example, you can see how we set our “colors” sample to “Blacks,” then increased black and removed some of the blue haze from the darks in the image. 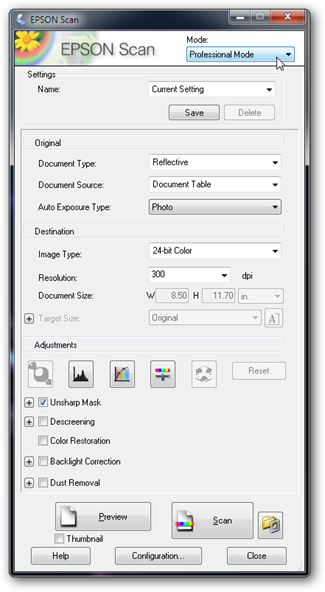 We can also use this same tool to adjust the apparent white balance of the image, removing the yellow cast in the highlights and midtones. 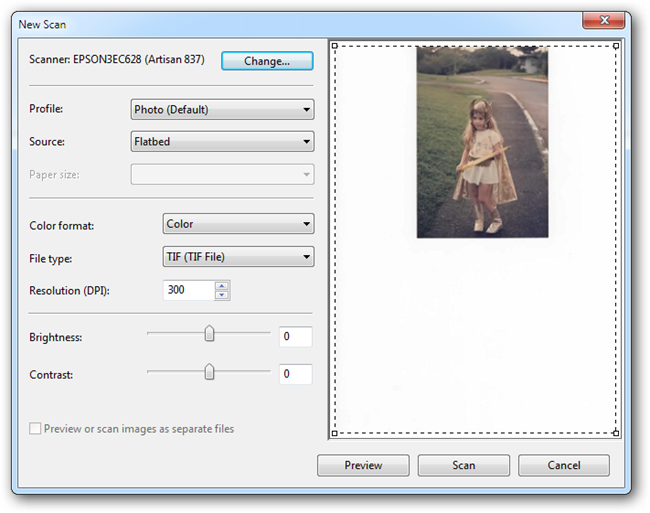 Lots of additional improvements can be made after the scan to make the image perfect. For help getting your image to look as good as possible, check out our previous how-tos on adjusting contrast like a pro, adjusting color like a pro, how to use a histogram, and how to use freeware Raw Therapee to adjust Raw files (as well as scans). You may also be interested in the easy How-to Geek method on removing dust and scratches from scans. Are you a scanner master and think you have some great advice to share? Let us know in the comments, or send your thoughts or questions to ericgoodnight@howtogeek.com. They may be featured in a future How-To Geek Graphics article. Image Credits: Photos of the author’s family, names and copyright information withheld. Any reuse of these images is a violation of the photographer’s copyright and intergalactic law.